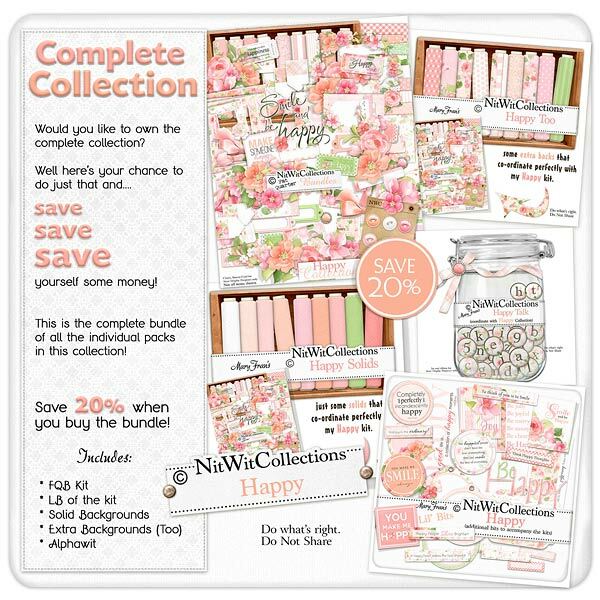 Bundled "Happy" Collection is exactly what the title says.....a very happy kit with fresh colours, patterns and elements that will help you to easily create your scrapbook layouts, mini albums and cards. Everything in this digital kit guides you toward creations that are inspirational and upbeat....and will hopefully give your day a lift too! Choosing from the pretty background papers, is it the floral digital elements that have captured your attention or the brads with shining gems ringing their frames, or perhaps it is the poignant sentiments on the journal cards that have given you the inspiration for your next project. There are so many options and creative avenues for this kit, you choose what suits you! !